21/10/2015 – Ireland and the EU have agreed to modest social and environmental targets for 2020, but even these will not be met without a change of direction. The Better Europe Alliance in its meeting with the Joint Oireachtas Committee on European Union Affairs today will call for social and environmental concerns to be put at the heart of EU policy. This requires a change of policy direction without which the EU and Ireland will fail to meet commitments on poverty reduction and climate change in 2020. 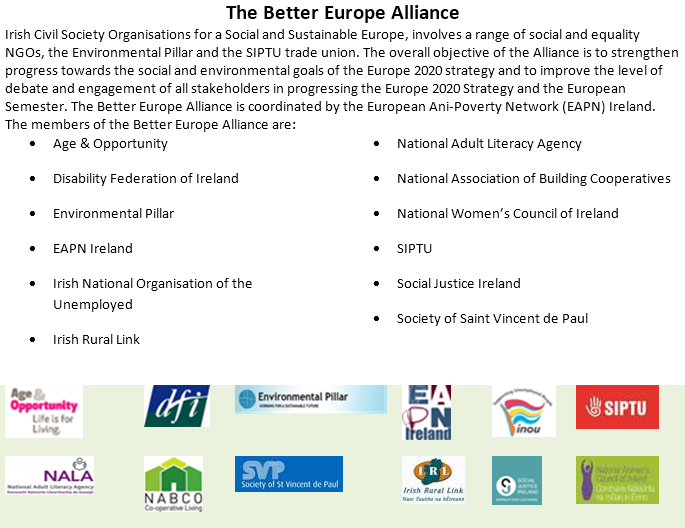 The Alliance of twelve civil-society organisations, including social and equality NGOs, the Environmental Pillar and the SIPTU trade union is responding to the Country Specific Recommendations for Ireland from the European Commission. This is part of the EU’s European Semester Process which monitors each country’s economic policies and their progress on agreed targets on climate change, poverty, employment and education. The Recommendations to Ireland for 2015 cover macroeconomics, cost-effectiveness in health, increasing the work intensity of households and addressing child poverty. Paul Ginnell, from the European Anti-Poverty Network Ireland, stated that “while there are some positive proposals, the focus is still mainly on balancing the books at any cost. This is a continuation of the same EU policies which have resulted in 5 million more people living in poverty across the EU now than in 2010, despite agreed targets to reduce poverty. Audry Deane from the Society of St Vincent de Paul said “if implemented correctly, the Recommendation on low-work intensity households and on child poverty which recommends that people can hold onto their out of work supports for some time on entering work is positive. Also is the call for better access to affordable childcare. However, this must be quality childcare which will involve a high level of investment. Currently the investment in early childhood, education and care in Ireland is only half that of other similar countries”. Joan O’Donnell from the Disability Federation of Ireland said that “the focus on cost-effectiveness in the recommendation on health, while important, is too narrow. We had proposed that the Commission made a Recommendation that addressed the issue of inequality in the health system, particularly for those on low incomes who have worse health outcomes. There needs to be greater attention paid to addressing problems in the neglected primary, community and continuing care sector”. Michael Ewing from the Environmental Pillar expressed that “we are very disappointed that the EU has still not issued a Recommendation for Ireland on climate change despite the fact that Ireland will fail by a substantial margin to reach its Europe 2020 target for reducing Greenhouse Gases. This is something which must be addressed urgently or we will all face the consequences”. Among its proposals the Alliance is calling for greater balance in EU and national policy meaning that social, environmental and economic policy must be seen as connected and of equal importance. This involves the poverty, equality, gender and environmental impact assessment of all relevant policies when they are being designed and implemented. They are also calling for the maximum resources to be made available for investment in essential public services including early childhood care and education, social housing and an inclusive health system. This involves ensuring that taxation levels are adequate to fund these services.